As the world waits for the Cypriot parliament to vote on the EU levy, our woman on the ground Christine Armstrong talks to local Cypriots, Brits and Russians to find out what lies in store for the beleaguered island. There is another troika at the heart of the Cyprus financial crisis: the three communities most visibly reeling from news of the levy. The Cypriots, the British expats and the Russians. Each group draws on its own life experience as reference points. The Cypriots live with the insecurity and anger that followed the Turkish invasion of the North in 1974. The British expats came to Cyprus to pursue their dreams of a better life in the sun and many are frustrated by the seasonal nature of work, poor pay and declining house prices. The Russians are a more elusive crowd of business people, fixers for the tourists and investors - many of them have bought houses here. The British expats spent yesterday's bank holiday at the pub – where else? - talking and talking and talking about the crisis. Predicting riots and bulldozers and armed Cypriots on the streets come Wednesday, if and when the banks open. Rumour is rife that everyone in finance knew this was coming and that recent months have seen a surge in the installation of safes in private homes. They are full of angst and are chasing rumours. Steve, a plumber, says 'The Chinese are coming next. They want to use Cyprus as a trade bridge between East and West'. Paul, a pool maintenance man, says, ‘I think the Russians are taking over. Do we answer to Putin now?' They debate with dry amusement which army would win in a standoff between the Turkish, the Russians and the Chinese. They see Cyprus as a tiny island being fought over by giants hungry for gas reserves that the Brits question even exist. By contrast the Cypriots were celebrating – it was Green Monday yesterday, the start of Christian Orthodox Lent, when they head out to national parks and beaches to BBQ shellfish, fly kites and race motorbikes. If you didn't read the news, you would have had no idea anything unusual was going on for all the family fun. Many Cypriots say they are resigned to the inevitability of the EU decision. 'Either way it is bad' says Maria a sanguine local publican. 'Without the levy, people who have money in a bank that collapses will lose everything. With the levy everyone loses something. Perhaps this is the better way,' she shrugs. They too resent that they are paying the price for lax financial rules that allowed money laundering, created the property boom that spun out of control and ended up with the banking system on the brink of collapse. Everyone says they know someone else who plans to withdraw all their money when the banks do open. Talk of a Russian rescue is greeted with reservations; many have mixed feelings about the Russians. What of the Russians? They sit on the sidelines, waiting. They are used to the state acting in arbitrary ways. ‘We remember reforms that were carried out in the Soviet times. We've all experienced it, felt cheated, and so we retain distrust towards everything connected with the banking system.’ Natalia, a travel agent, doesn't think it will hurt tourism in the short-term but thinks it will 'poison' relations between the two countries and add to tensions between Russia and the EU. Certainly she and other Russians react angrily to the repeated allegation that anyone with business dealings in Cyprus is a money-laundering criminal. Like the Cypriots, the Russians see the logic of the levy, and realise that without it there could be a far worse outcome. 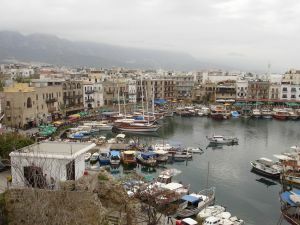 Natalia notes that in 2012 the number of Russian tourists coming to Cyprus increased by 42% to 224,000. 'These are normal families escaping to the beach and some sunshine in a place near enough to home to be practical’. She thinks they will continue to come. Unless 'mass riots start'. Another Russian observer, who asks to remain anonymous, adds, ''The reactions from our president and premier means there is a lot of money they are interested in and this will change the relationship between the countries. The question is where the money moves to now. Where would be better? Russia - no way, EU - no, US - no. Think about it... For sure everyone will be a lot more careful now. Don't use my name. We are still in Putin's country'. The outrage of the British expats is grounded in their greater expectation of fair government. The Russians and Cypriots have a different life experience and seem tougher somehow, or at least more used to officially-generated reversals of fortune. All agree there is no good outcome. Not just because of the levy but because everyone knows that the banks are peering over a precipice. When Alistair Darling called the British banking heads to Downing Street in 2008, most of us did not know that he feared the cash points running dry within two hours. We discovered that detail much later. Cyprus is not being spared the harrowing reality. Find out more about the Cyprus banking bail-out saga.